In recent weeks have transpired a number of attacks and acts of harassment against journalists in Mexico. On 20 November in Mexico City, the home of the journalist Gloria Muñoz Ramírez was raided. Muñoz Ramírez is the director of the electronic magazine Desinformémonos and a columnist for La Jornada. Moreover, the editorship of Desinformémonos suffered a robbery and a cyber-attack. The magazine is dedicated to documenting popular struggles and social movements in Mexico and throughout the world. “This attack takes place within the context of grave attacks on journalists in the country, thus harming the right to information and putting at risk the lives, integrity, and personal security of those who dedicate themselves to communication,” noted the Fray Bartolomé de las Casas Center for Human Rights, based in San Cristóbal de Las Casas, Chiapas, in a communique. Moreover, on 25 November, the journalist Maite Azuela received a death-threat at her home in Mexico City. The articles written by the journalist are dedicated to human-rights policies and violations, recently related to the Army, as led by General Salvador Cienfuegos, and the state government of Puebla, directed by Rafael Moreno Valle. On 27 November in Guerrero, the general secretary of the state government, Florencio Salazar Adame, interrupted into a radio program and threatened the journalist Sergio Ocampo Arista, a news reporter, who had been discussing “suspicious” acts taken by the State. According to the Journalistic Investigation Agency, Salazar Adame “arrived violently to the radio station and took the microphone to warn Ocampo […] that he should be careful with the criticisms he launches against the PRI government of Astudillo Flores,” governor of Guerrero. 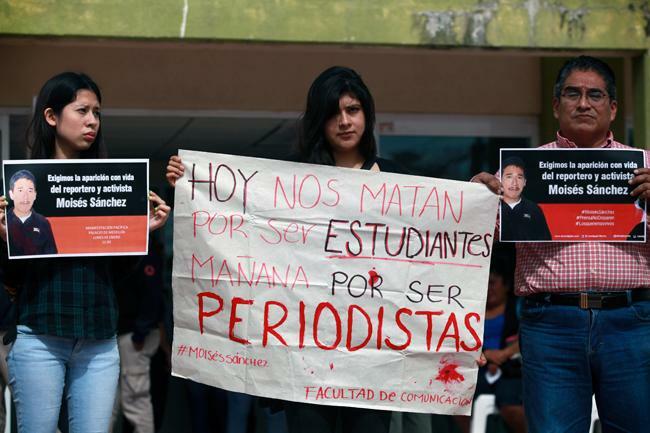 Recently in Veracruz, at least 12 journalists were attacked by public-security forces. Amidst these incidents, the Mexican Commission for the Defense and Promotion of Human Rights (CMDPDH) and Amnesty International Mexico (AI Mexico) submitted more than 12,000 signatures to the state authorities to demand that all the necessary measures be taken so that the Mechanism of Protection for Rights-Defenders and Journalists in Mexico function effectively. CMDPDH and AI indicated that the “work of rights-defenders in the country is risky and despite the fact that since 2012, there exists a law establishing a mechanism to protect these defenders and journalists who are at risk, it has not been implemented effectively due to lack of interest on the part of politicians.” From 2000 to date, the National Commission on Human Rights in Mexico (CNDH) has registered 107 murders of journalists; 20 disappearances of journalists between 2005 and 2015; 48 attacks on media institutions from 2006 to date and a total of 506 complaints from 2010 to 2015. Beyond this, between 2014 and 2015 the CNDH has authorized 26 precautionary measures.